For sale by auction in New York on May 13. According to Christie’s Realty International, “the house remains singular as the most important example of mid-century modernist architecture in the Americas to remain in private hands. 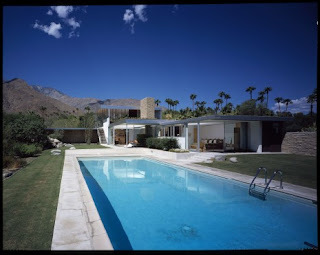 Designed by Richard Neutra, the house of glass, steel and stone in Palm Springs, California, was built for Pittsburgh department store magnate Edgar Kaufmann in 1946. Kaufmann also commissioned Frank Lloyd Wright to build Fallingwater, the architect’s signature house in Pennsylvania. 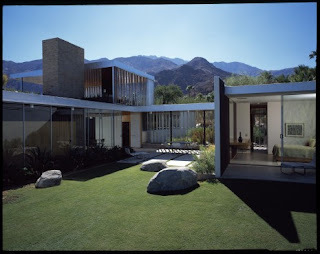 Known simply as “the Kaufmann house,” Neutra’s minimalist creation is set against the rugged Southern California mountains, is touted as a leading example of the modernist style. Singer Barry Manilow once owned it. Marketing materials from auction house Christie’s Realty International compare it to Mies van der Rohe’s Farnsworth House and Philip Johnson’s Glass House, in terms of architectural significance. You are currently browsing the archives for the Kaufmann category.